A Grade Ahead, is an educational enrichment company dedicated to helping children excel academically. Many of the families who enroll their children in A Grade Ahead’s enrichment academies or Enrichment at Homeprograms have experienced education in a country other than the United States. A Grade Ahead’s employees and franchise owners also have experience living and going to school elsewhere. We asked Elaine Timbuleng, a writer and teacher at A Grade Ahead of Powell who is from Indonesia and Avantika Kishorepuria, the franchise owner of A Grade Ahead of Avon who is from India to share their thoughts. WHAT IS THE BIGGEST DIFFERENCE BETWEEN THE UNITED STATES’ EDUCATIONAL SYSTEM AND THE ONE FROM YOUR HOME COUNTRY? Avantika: In the USA, there is very little or no homework given in elementary schools. There is a belief that children should have free time to play, which I see translates to watching TV and being on electronic devices. In India, written homework is given that would perhaps take at most 45 minutes. This sets a strong academic foundation at an early age. Also, in India, there is no free public education. Parents pay tuition, so they are vested in their child’s education. Children are held back if they are not ready to move on to the next grade level, so parents make sure to spend time to study as they do not want to spend an additional year of tuition. I have 2 pens, 3 cups, and 1 spoon. I have 2 pens, 3 cups and 1 spoon. Where are you going? You are going where? WHAT WAS THE BIGGEST SHOCK TO YOU WHEN YOU STARTED SCHOOL IN AMERICA? Avantika: No school uniforms, free public education system, free food programs for needy kids and three months of summer break. Elaine: In Indonesia, you must have your own school supplies and transportation. These were not provided by the schools. All schools require you to be uniformed from head to toe (top, bottom, even shoes!). The uniform must have the color of the country’s flag. Each time a teacher enters a classroom, all the students are required to stop whatever they are doing, stand up, and greet the teacher. But the most shocking thing is that there are 6 days of school, Monday through Saturday from 8 a.m. to 2:30 p.m. in Indonesia. The longest break is in December for about 3 weeks. Other days off are national holidays for one day each time and no summer breaks! WHAT DID YOU LIKE THE MOST ABOUT SCHOOL IN AMERICA? Avantika: I love how English is taught in schools here with novels, book reports, and literature circles. Children are encouraged to read all kinds of books and libraries are well-stocked. There is no emphasis on memorization of facts, but kids are encouraged to express their opinions. Science is very hands on at a young age. Elaine: The school bus, schools supplies, no uniforms, more freedom—and, of course, the summer breaks. WHAT DID YOU LIKE MOST ABOUT SCHOOL IN YOUR HOME COUNTRY? 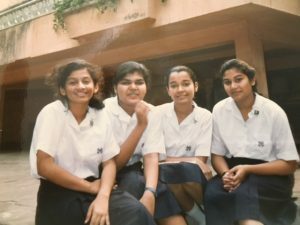 Avantika: I liked how we had school uniforms and restrictions on shoes, socks, hair styles, and other accessories. Math was emphasized from younger grades. Breaks were evenly distributed. There was even a subject for General Knowledge, which kept us updated on current affairs. Elaine: I have a ‘love and hate’ relationship with the uniform system. I like it because I did not have to worry about picking out an outfit to wear every morning. WHAT DO YOU THINK THE UNITED STATES SHOULD BORROW FROM THE EDUCATIONAL SYSTEM IN YOUR HOME COUNTRY? Avantika: There should be a little bit more emphasis on regular written homework. This sets a strong work ethic. Breaks should be spaced out. Grade retention should be enforced rather than social promotion. Elaine: Kids learn math faster in Indonesia. For example, things that are learned in high school in the U.S. are learned in middle school there. I am not sure how, but I believe the extra day of school that we do not have here has something to do with this. There’s also less calculator usage in Indonesia. HOW DID YOUR FAMILY’S BELIEFS ABOUT EDUCATION DIFFER FROM THE TRADITIONAL AMERICAN VIEW? Avantika: Academics come first, everything else is second. You have to study from a young age to be successful in life later. We were always taught that education was the path to success in life. There are no short cuts. Hard work pays off. Elaine: My parents think that education is very important. Although they prefer us not to go for arts or sports, they want us to study anything that we are most passionate about and be successful. These are just two perspectives on the differences in educational systems across the world. What do you think? Do you the United States should borrow some practices from India or Indonesia? Do your children attend a program like A Grade Ahead to bridge the gap between the American education system and the standards of your home country?